First, let’s discuss what LED light therapy is! LED light therapy is a process that emits infrared lights on your face in different wavelengths or spectrums. 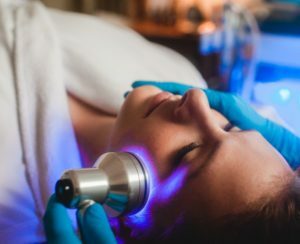 These bright light-emitting diodes send low-level light energy into the deeper layers of the skin and trigger certain reactions in your skin cells. These reactions happen at the dermis layer of the skin. Your dermis layer converts the light into a fuel of sorts that the cells then use to do its job in healing the skin. But what kind of reactions will you get in the skin? That is determined by what light we are using! Red light LED stimulates cellular activity, including fibroblasts that produce collagen, which gives young skin its plump look. It also increases blood flow to the skin and capillaries on the face. This promotes healing and rejuvenation. Red light is also believed to target oil glands to reduce cytokines, which cause inflammation and play a role in chronic acne. Red light can help to soothe acne by improving circulation and inflammation through heat transfer. 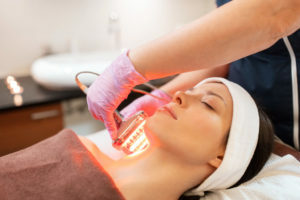 Red light can also be used in conjunction with blue light to treat acne. Blue light LED works by killing Propionibacterium acnes, the bacteria the lives below the surface of the skin and is responsible for acne. The blue light is able to generate a high energy form of oxygen that attacks the bacteria in the skin. It is also said to help reduce excessive oil production in the skin by causing the oil glands to shrink in size. Have you experienced the amazing benefits of LED light therapy yet? We offer both Red and Blue Light LED Therapy here at Soma Medical Spa. Give us a call to ask about adding LED light therapy to your upcoming facial!